The 2016 Rose Festival begins this weekend and promises ‘Excessive Celebration’ in the weeks ahead. Enjoy the festivities and avoid parking hassles by leaving the driving to TriMet. This weekend’s kick-off includes CityFair, fireworks, RoZone concerts (including Sir Mix-A-Lot!) and the 0.1 run – the world’s shortest half marathon. All the events take place at Tom McCall Waterfront Park and getting there is easy with TriMet. Some 20 bus lines and all MAX lines serve the Portland City Center, and drop you a short distance from Waterfront Park. Don’t bother watching the time. Buy a Day Pass. It’s the same cost as two 2 ½-Hour tickets. Go mobile! Download the free TriMet Tickets app to buy fares for your family. No need to keep track of your tickets; they’re stored in your phone. 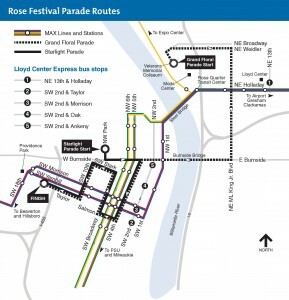 Rose Festival means parade time and, if tradition holds true, the parade days will be TriMet’s busiest of the year. For the 40th year, the Starlight Run & Parade lights up the night on Saturday, June 4. Then, the centerpiece of the Rose Festival – the Grand Floral Parade – takes to the streets in Portland City Center on Saturday, June 11. All bus and MAX lines will run on Saturday schedules on the parade days. After the Starlight Parade, MAX trains will be running later than regular on MAX Green, Orange and Yellow lines. More at trimet.org/rosefest. Go early. Some bus lines will be detoured and buses and trains will experience delays at times during the parades. Check trimet.org/alerts before heading out. Buy Day Passes when heading to the parades to avoid long lines at ticket machines afterwards. TriMet staff and volunteers will be at several MAX and bus stops to provide help and sell tickets. Or try out the free mobile ticket app. No need to keep track of your ticket. Your fare is stored in your phone. Be patient and expect long waits for MAX trains following the Starlight Parade as everyone attempts to head home at the same time. Avoid bringing big strollers on MAX. With huge crowds expected for the parades, those with a big stroller or bike may have to wait longer to find space on the trains. The Rose Festival Junior Parade celebrates Portland’s Children on Wednesday, June 8. The parade winds through the streets of the Hollywood District from 1 p.m. to 2 p.m. It will lead to some bus detours and delays. Ships and other-fleet related vessels have been making Portland their port of call since the very beginning of the Rose Festival back in 1907. Fleet Week begins Wednesday and Thursday, June 8 and 9, when the ships arrive. They leave on Monday morning, June 13. Both the arrivals and departures will lead to MAX delays due to Steel Bridge lifts. Plan extra time if riding MAX those days. Also, buses that use the Broadway, Steel and Burnside bridges will be delayed and may be detoured. Check trimet.org/alerts during the lifts. There’s more Rose Festival fun for you and the family. Go to rosefestival.org to learn about all the different events. Then, head to trimet.org and use TriMet’s online trip planner, which makes it easy to plan your trip with information on travel and walk times, transfers and cost.